Things didn’t go the way trainer Brendan Walsh hoped that they would when Plus Que Parfait raced in the Lecomte Stakes (G3) last out. However, like any good horseman following a series of unfortunate events, he is putting it behind him and hopes that the son of Point of Entry will see a more favorable outcome in next Saturday’s Grade 2 $400,000 Risen Star Stakes. Plus Que Parfait has proven capable of beating good horses. In his maiden special weight victory at third asking, he defeated eventual graded stakes winner Harvey Wallbanger as well as next out winners Cutting Humor, Absolute Control and Tactical Quality over the main track at Keeneland in October. He was a hard-fought second next out in the Kentucky Jockey Club Stakes (G2) at Churchill Downs behind Signalman and finished ahead of graded stakes winner Kicks Go and Current. 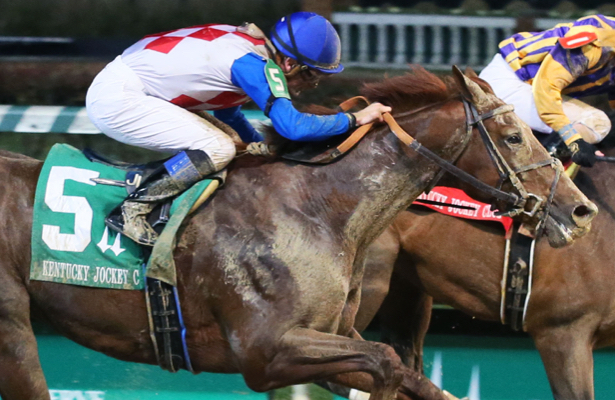 Bred in Kentucky by Calloway Stables, Plus Que Parfait was purchased by Oracle Bloodstock from Vinery Sales consignment barn for $135,000 at the Keeneland September Yearling Sale in 2017. He is the second foal of the Awesome Again broodmare Belvedera whose dam Forever Land was a Grade 3 winner on dirt and produced black type winner Touch Dial and Grade 3-placed Forever Rush.